Antonia Giuseppa Torre first appears in the Painesville, Ohio, area in 1921. 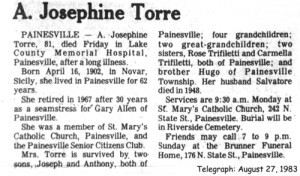 In America, Antonia Giuseppa Torre was known by her married name, Josephine Torre. Antonia Giuseppa Torre, daughter of Nunzio Torre and Giuseppa Puglisi, was born on April 16, 1902, at Novara di Sicilia. Antonia Giuseppa probably lived in Switzerland in the early 1910’s. Her father was a migrant worker building a tunnel in Switzerland. The family returned to the family home in Novara di Sicilia, in 1916. She married Salvatore Torre, son of Giuseppe Torre and Nunzia DiCarlo, in 1922. Antonia Giuseppa died on August 26, 1983, at Lake County Memorial Hospital, Painesville, Lake County, Ohio, at age 81. Her body was interred at Riverside Cemetery at Painesville, Lake County, Ohio. Antonia Giuseppa Torre, age 19, immigrated to the United States on October 25, 1921, travelling to Fairport Harbor, Ohio. She was joining her father, Nunzio Torre, in Fairport. Antonia Giuseppa Torre became a citizen of the United States on March 3, 1941. Antonia resided at 142 Sanford Street, Painesville, Lake County, Ohio, when she was naturalized. All of Josephine’s siblings eventually lived in Painesville. Brother Ugo Torre immigrated in 1928; sister Carmela Torre in 1928; and sister Rosa Torre, in 1955. Josephine was employed as a seamstress by Gary Allen. She retired in 1967 after 30 years of service.